Heightened demands from customers and a wish for better efficiency and accuracy in the warehouse made Norwegian company Hardanger Bestikk invest in a modern WMS. They ended up choosing Apport Systems and it has sent picking efficiency sky-high with 40-50 percent. At the bottom of the beautiful Hardangerfjord in Norway lies the small town of Kinsarvik. Since 1958, one truck after the other has delivered exclusive gifts to the Norwegians from here, because here is Scandinavia’s largest stainless steel cutlery – Hardanger Bestikk. As maufacturerof an acknowledged quality product, Hardanger Bestikk have been used to putting the conditions in relation to delivery, but in recent years things have changed. “We haven’t had such focus on logistics in the past, but we find that it gets more and more important. Our customers require more of us in documentation and individual customization. Previously, we as a manufacturer could determine the terms, but now it is influenced a lot by the demands of the major chains, and we must be able to live up to this, “says Oddbjørn Pedersen-Rise, Chief Operating Officer. 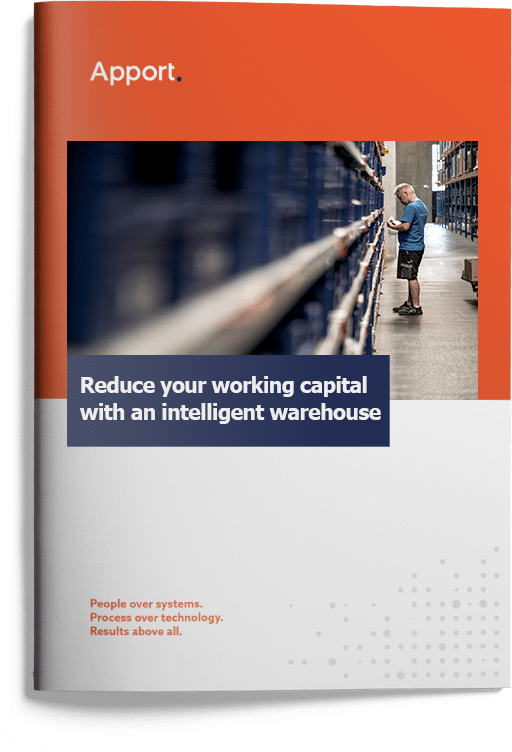 Previously, Hardanger Bestikk managed their warehouse, with a system that was primarily based on manufacturing, but the increased logistics requirements made it necessary to restructure the company’s processes and introduce a dedicated WMS. Before Hardanger Bestikk signed the agreement with Apport Systems, they went through a thorough selection process. A screening of the market for potential suppliers in Norway, Sweden and Denmark led to a list of three select companies, who were given the opportunity to bid for a solution for Hardanger Bestikk. “First and foremost, we looked at the technicalities – if suppliers could meet the requirements specifications we had set. This was a basic requirement, and all three of them lived up to this. Then, of course, the price also played a part and for us it was very positive that Apport worked after a fixed price. From our previous experience with IT projects, we know that they often become more expensive than the price that was originally set, so the fixed price gave us a sense of safety, “says Oddbjørn Pedersen-Rise. However, the most important thing in the selection process was the supplier’s approach to project management. “We focused a lot on how they planned to implement the project. We do not have the internal resources to control this ourselves, so we were very dependent on finding a supplier who was able to get the job done at the right time and for the price that was agreed upon. When it comes to project management, chemistry between the two parts plays a big role, and through our meetings with Apport, we felt sure that they were the right company to help us, “says Oddbjørn Pedersen-Rise. Apport works after a fixed price concept that ensures that the budget never runs off track. Reda more about our fixed price concept. Apport Systems solution for Hardanger Bestikk, does not just include warehouse management, but also a system that supports the manufacturing process. Therefore, the implementation of the system has caused some radical changes in the company's processes. “We kicked off the project in February 2014, and then the summer and fall to make adjustments to the system. In this period, we had weekly project management meetings on Skype, and I experienced it as a very positive process. After the system went live for real in April 2015, it’s been running well. The adaptation of manufacturing is a major process in which we have also made some changes, but Apport has been good at seeing the situation form our perspective and helping us make it work, “says Dagfinn Vines, who is logistics manager and has been project manager on the WMS project. The employees in the warehouse have quickly taken to the system. However, with one of the employees in particular, there was some excitement about how it would go off. When using a hearing aid, the company was excited about how things would work when the PDAs were replaced with voice-controlled terminals with Apport Voice technology. “The system can be attached to the hearing aid, and it has exceeded all expectations. She is actually the most effective one in the warehouse, “says Dagfinn Vines. After just under half a year of operating with Apport WMS, Hardanger Bestikk can conclude that the wish for improved efficiency has been granted. “There is no doubt about this. Individual employees have much more capacity than before, and if we look at the pick-up efficiency alone, it has increased by 40-50 percent. Adding to these numbers, there are also certain tasks that the pickers don’t perform anymore, so the net efficiency is a little lower. Previously, it has been restocking tasks that took a lot of the pickers’ time, but with the new system we have been able to optimize our workflows, so we have better preparation for picking, “says Oddbjørn Pedersen-Rise. The accuracy of the inventory has also improved, but this process takes a little longer to get completely done, so the full potential is not yet reached. “We have made some changes in our registration routines in manufacturing when implementing the system in order to get a more accurate inventory balance. It takes a while to get these routines incorporated, but it’s definitely going in the right direction, “says Oddbjørn Pedersen-Rise. Founded in 1958 by Odd and Kirsten Leikvoll. The company is still family owned today. Located in Kinsarvik, south of Bergen in Norway. 48 employees at the factory, of which 6-7 in the warehouse. Has received several design prices, including one for their Tuva series. Museum of Modern Art (MoMA) in New York sells Hardanger Bestikk in their shop.